Following on from another successful exhibition we are now planning for The Friends of Holland Park Art Exhibition 2016. Last year we asked all exhibiting artists to give us feedback about the exhibition and have already implemented some of your suggestions. Holding two Private Views instead of one was a huge success and we will continue with two Private Views in the future. Unfortunately there was a postal problem that affected the delivery of the tickets. The fault was with Royal Mail not The Friends of Holland Park but thanks to the grace and good humour of you, the artists, most were able to collect their tickets when delivering artworks to the Orangery, and both Private Views were well subscribed. We will continue to refer to your suggestions and implement them when possible. I am delighted to announce next year’s Feature Artist, Mao Wen Biao. Mao was responsible for the beautiful mural in the arcade leading to the Orangery which was described by Sir Hugh Casson as '…a spectacular achievement – appropriate to its setting, very skilfully painted and deserving the praise with which it has been greeted'. Born in Shanghai in 1950, Mao studied in Beijing before moving to the UK where he trained at the Royal College of Art. Other large murals by Mao have been commissioned by the Chinese government, the RAC and the Ritz Hotel in London. Mao is based in the UK, dividing his time between his home in Kent and his studio in London, but visits China regularly. I am greatly looking forward to curating the Feature Artist panel so that the Friends can be better acquainted with the art of the man behind the mural. As some of you may already be aware, due to increasing work commitments, I have stepped down as a trustee of The Friends of Holland Park. Taking my place is my wife Sandra (pictured), who many of you will know from her work with me on the exhibition. I will still organise the art exhibition, so nothing in that respect will change, but with Sandra taking over the trustee responsibilities I will have more time to develop ideas and improve the event. Now to the 2016 exhibition. The conditions of entry remain unchanged from previous years. Friends who are artists and artists who become Friends are invited to exhibit up to ten works: two framed works to hang on the walls and up to eight unframed works for display in the portfolio stands with a maximum size of 70 x 100cm (including mounts, but no wooden mounts, please). 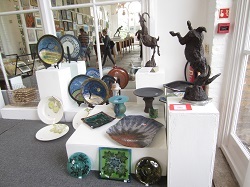 Friends are also invited to exhibit up to ten three-dimensional objects such as ceramics, glassware and small sculptures, or enter the mini-mart of small works on offer at £40 and under, including cards and craft items. The minimum price for works in the main exhibition will be £50. Friends interested in exhibiting in the art exhibition, the mini-mart or both need to register by filling in the order form (download here) and pay the £10 entry fee. Please note that artists who have registered for the main exhibition may also include small works in the mini-mart at no additional cost. Completed order forms should be sent to Rhoddy Wood as soon as possible because space is limited, and when enough artists have registered we cannot accept any more. Information on The Friends of Holland Park Art Exhibition is available from me, Gordon French, 19 Kensington Court Place, London, W8 5BJ; tel. : 020 7937 7222; e-mail: gordon.l.french@gmail.com. Let’s have a great exhibition! as this would spoil the exhibition for others. You will know trustee Gordon French from the sterling work he has done to develop The Friends’ Art Exhibition so that it continues to be successful after more than 30 years. Many of you will also know how much work his wife Sandra and daughter Alex do for the organisation of the exhibition. Due to increasing commissions for his paintings, Gordon and Sandra proposed that she become the trustee of The Friends so that Gordon has more time to concentrate on the creative aspects of our art exhibition, his painting and running Gallery 19. So we are fortunate that we retain the support of the whole French family, but Sandra will now be the trustee rather than Gordon. 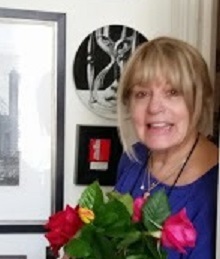 Sandra is Australian of Italian parents and has been in London for 30 years, had a corporate career and is now co-director of Gallery 19 which specialises in art of her two favourite areas, Kensington and Italy. Sandra is actively involved with her local community. All contact concerning the art exhibition should continue to be via gordon.l.french@gmail.com, or 020 7937 7222, and Gordon will continue to be the contact for artists. The Friends of Holland Park Art Exhibition received another wonderful response this spring. Attendance was up, and sales of exhibitors’ artworks were on a par with last year: a very enjoyable and successful exhibition. I felt the standard and quality of the artwork was incredibly high; this view was supported by artists, Friends, visitors and by our long-standing judge, Isabel Langtry. The exhibition was again superbly hung by Alison Beckett who was assisted by Charles Bauccio and Graham Franklin. Thank you all once again. After our oversubscribed private view last year we decided to hold two this year. Unfortunately there was a problem with the post office, and the majority of artists did not get their tickets until they delivered their paintings to the Orangery on the morning of the private view. This mishap did not stop two highly successful private views, and from the feedback we have received, the artists and their guests were happy with the results. We will continue with this format. Unfortunately I had to return to Australia after the opening, leaving my wife Sandra and daughter Alex to administer the exhibition with the help of the trustees and stewards. An enormous thankyou to you all. Again we were sponsored by Killik & Co., the long-established investment and wealth advisors located at 281 Kensington High Street, and I would like to take this opportunity to thank Julian Chester and his team for their ongoing support. This year our feature artist was the late Marika Eversfield who had the remarkable record of exhibiting at every single Friends art exhibition since its establishment 33 years ago. The proceeds from the sale of her artworks will go to Bel Canto in Barga International Singing Festival in Tuscany which Marika supported. The Friends who attended the two previews were treated to a performance by soprano Miss Sally Li. Thank you to Marika’s family, Carolyn and Geoffrey Marks, for organising the recital. Once again we had generous support from local restaurants and businesses for the raffle, proceeds all going to the Friends. Thank you to all the artists: without your support there is no exhibition; to Joy Puritz for her contribution year after year of putting together the catalogue; and the stewards and trustees. We look forward to doing it all again next year. My walk into the park was an inspiration: to walk and then arrive at an exhibition of art is my idea of a perfect evening. 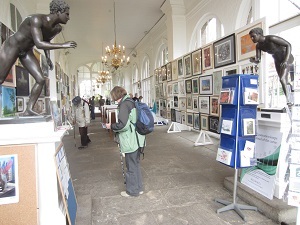 The Friends of Holland Park Art Exhibition 2015 in the Orangery showed a range of diverse artworks, with sculpture, applied art and paintings of all types, alongside photographs, prints and drawings beautifully displayed by the hard-working hanging team who make the viewing of the work a pleasure. In order to continue encouraging such a broad range of submissions I am delighted that Gordon French has accepted my offer of a new, yearly prize: The Hampstead School of Art Prize for Applied Art. Each year the prize-winner will receive a term of an art course of their choice, at the school. This prize joins the Sir Hugh Casson Prize for Drawing, new last year and awarded posthumously by Sir Hugh’s daughters, he having been a former president of The Friends. I enjoy looking through the browsers which are always full of visual treats, many reasonably priced, and if you bought a piece, well done: your contribution is extremely important in supporting Holland Park and in encouraging the artists. Many artists received a special mention from me at the private view and I congratulate you all again for submitting work, contributing to an excellent exhibition and supporting an event that makes such a valuable contribution to the art world and our communities. Paintings of bees and of baby elephants, classical portraits and rain-lashed landscapes were among a spectacular and inspired variety of works which filled the Orangery to overflowing in the annual Art Exhibition this spring. Wild creatures were especially abundant, most notably the bronze goats of 3-D-prize-winner Barbara Foster, leaping and dancing in magical fashion [see photo bottom right]. Simon Taylor’s terracotta plates, bearing motifs of frogs, birds and bees, were brimming with fun, and Tania Beaumont produced a magnificent mixed-media interpretation of the workings of a hive. Patricia Morrison captured the gentleness of elephants in her watercolour of a mother and baby, while Amanda Mann created a joyful mixed-media picture of hens that could almost be heard clucking. Among other stars were Jennifer Bush’s parrot Kiku in pastel, and a hawk which featured in Lilian Schayek’s watercolour of a Japanese New Year fantasy dream meant to bring good luck. An affinity with cats was unmistakable in Bob Barling’s delightful gouache portrait of a father and son. Likewise Masako Jikihara showed her understanding of feline thinking in a wonderful colour etching of a cat puzzling over its shadow. The weather proved a great inspiration for Anne Musso in her paintings of Holland Park, on the one hand with a riot of pink flowers in glorious sunshine, and then with trees bending in driving rain. Black and white trunks of birch trees were the basis for a striking composition in acrylic by Shohre Vakili. But it was a subtle light glimpsed through the trees which captivated Iwona Behar and won her The Prize for Artistic Excellence with her delicate depiction in pastel. A resounding image of waves breaking against rocks was recreated by Noreen Smalley in pastel, and Joanna Irvin captured the wonder of the Isles of Scilly and the romance of the shoreline in two beautiful aquatint etchings. Hazel Fennell’s highly accomplished and deceptively simple blue and white abstract, meanwhile, made a stunning contrast. A classical portrait of St Benedict by Anna Jones, drawn in charcoal with an amazing luminosity, won the Sir Hugh Casson Prize for Drawing. Patrick and Eugenia Killery both showed their talent for portraiture in oil, as did Danielle Sacher. However, Marek Jakubowski’s double portrait was the most poignant: a black-and-white photograph of two young children on their first date. John Schetrumpf also brought a smile both with his mechanical man in aluminium sheet and wood who was ‘pondering’, and with his clever picture comprising a place setting of a broken cup and plate stuck on board, and the idea that there was no dish of the day left except ‘crackling’. A photograph in colour of Holland House through an archway won The Spirit of Holland Park Prize for Nadhira Benaissa, while Dmytro Dobrovolskyi chose oil to depict the Ice House and its surrounding flower beds with exquisite intricacy. But the most glorous celebration of colour of all was Renate Ober’s mixed-media picture of a Japanese fan amidst a wealth of flowers. Spring is almost here and The Friends of Holland Park Annual Art Exhibition will soon be installed in the Orangery: another splash of colour amongst the budding flowers of the park. Last year I wrote to the FHP artists asking for their feedback on the exhibition, and the response was fantastic. Some of the issues raised have been addressed in a letter I will be sending to the artists with their complimentary private view tickets shortly. Artists, please remember to send your completed exhibit details forms to me by Thursday, 12 March, and to specify if you would like tickets for the Friday night or Saturday morning private view; a reminder e-mail will be sent but if you cannot be contacted you will be allocated tickets for whichever event is available. We are delighted that Killik & Co., the long-established investment and wealth advisors located at 281 Kensington High Street, are sponsoring the exhibition again this year. This sponsorship enables us to offer free catalogues to visitors, print more posters and get more publicity. There will once again be a credit card facility in the Orangery for the duration of the exhibition, and a raffle with prizes donated by generous local businesses. 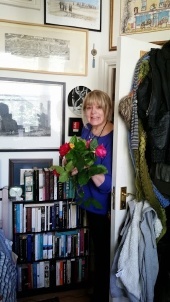 This year’s Feature Artist is the late Marika Eversfield who exhibited in every Friends art exhibition for 32 years until her death last year. Marika Eversfield was born in 1914 in Gyòr near Budapest. She studied at the art school in Vienna and moved to London with her first husband after their marriage in 1935. They divorced four years later but Marika stayed in London working as a housemaid and a fire warden. This decision probably saved her life: Marika’s mother and maternal grandparents all perished in Auschwitz. Marika married (and divorced again) and had her daughter Caroline. She worked at the Georgic Society, an organisation that provided training and employment for widowed refugee women, and started a business with a friend making leather belts, buckles and buttons, which supplied Fenwick’s, amongst other fashion stores. Fashion changed in the ’60s and the business closed; Marika did various jobs in antique shops and making patchwork quilts for Liberty. She took up painting and, in her mid-80s, gained recognition for her work and won the RBK&C art competition. She married the love of her life in the early 1980s and she and her husband bought a small house in Tuscany where they lived for a quarter of the year for the next 15 years until her husband died in 1994. She lived happily alone for the rest of her life, painting, and attending concerts. Marika died peacefully on 3 June 2014. She was 100 years old. All paintings by Marika Eversfield will be for sale, and the proceeds of this posthumous exhibition will go to a charity that was close to Marika’s heart.